The Kobe quake highlighted Japan's lack of disaster preparation. Earthquakes have claimed hundreds of thousands of lives in the last 100 years and improvements in technology have only slightly reduced the death toll. At least 437 people are killed in Peru's coastal province of Ica, as a 7.90-magnitude undersea earthquake strikes about 145km (90 miles) south-east of the capital, Lima. A 7.7 magnitude undersea earthquake triggers a tsunami that strikes a 200km (125-mile) stretch of the southern coast of Java, killing more than 650 people on the Indonesian island. Nearly 5,000 people die when a magnitude 6.2 quake hits the Indonesian island of Java, devastating the city of Yogyakarta and surrounding areas. Seventy people are killed and some 1,200 injured when an earthquake measuring 6.0 strikes a remote region of western Iran. An earthquake measuring 7.6 strikes northern Pakistan and the disputed Kashmir region, killing more than 73,000 people and leaving millions homeless. About 1,300 people are killed in an 8.7 magnitude quake off the coast of the Indonesian island of Nias, west of Sumatra. Hundreds die in a 6.4 magnitude quake centred in a remote area near Zarand in Iran's Kerman province. 26 December 2004:Hundreds of thousands are killed across Asia when an earthquake measuring 8.9 triggers sea surges that spread across the region. At least 500 people die in an earthquake which strikes towns on Morocco's Mediterranean coast. 26 December 2003:More than 26,000 people are killed when an earthquake destroys the historic city of Bam in southern Iran. 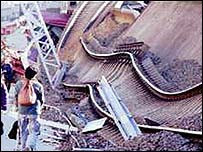 21 May 2003:Algeria suffers its worst earthquake in more than two decades. More than 2,000 people die and more than 8,000 are injured in a quake felt across the sea in Spain. More than 160 people are killed, including 83 children in a collapsed dormitory, in south-eastern Turkey. More than 260 people die and almost 10,000 homes are destroyed in Xinjiang region, in western China. Italy is traumatised by the loss of an entire class of children, killed in the southern village of San Giuliano di Puglia when their school building collapses on them. An earthquake measuring magnitude 7.9 devastates much of Gujarat state in north-western India, killing nearly 20,000 people and making more than a million homeless. Bhuj and Ahmedabad are among the towns worst hit. Around 400 people die when an earthquake measuring 7.2 on the Richter scale strikes Ducze, in north-west Turkey. 21 September 1999:Taiwan is hit by a quake measuring 7.6 that kills nearly 2,500 people and causes damage to every town on the island. An magnitude 7.4 earthquake rocks the Turkish cities of Izmit and Istanbul, leaving more than 17,000 dead and many more injured. May 1997:More than 1,600 killed in Birjand, eastern Iran, in an earthquake of magnitude 7.1. 21 June 1990:Around 40,000 people die in a tremor in the northern Iranian province of Gilan. An earthquake measuring 6.9 on the Richter scale devastates north-west Armenia, killing 25,000 people. The Chinese city of Tangshan is reduced to rubble in a quake that claims at least 250,000 lives. Up to 10,000 people are killed in the Nicaraguan capital Managua by an earthquake that measures 6.5 on the Richter scale. The devastation caused by the earthquake was blamed on badly built high-rise buildings that easily collapsed. 31 May 1970:An earthquake high in the Peruvian Andes triggers a landslide burying the town of Yungay and killing 66,000 people. An earthquake measuring 6.9 on the Richter scale strikes the Macedonian capital of Skopje killing 1,000 and leaving 100,000 homeless. 0 Response to "Deadly History of Earthquakes"